Simple test to see if your friends in Texas are good at math: anyone who says Wendy Davis "raised over $12 million" is NOT good at math. Sadly, we can put pretty much every liberal organization and all the newspapers in this state on this list. I mean, math is hard, especially for Democrats, but this is really ridiculous. Never in all the time I've been involved in politics has a candidate claimed outside PACs and other accounts as "their" campaign funds. Davis is claiming her state senate account, the Battleground Texas account, another statewide Texas Democrat account, and her gubernatorial campaign account to get to that $12 million figure. There's a defensive line coach for the University of Texas football team named Chris Rumph (no relation). Let's pretend for a moment he's the head coach. That's a big paycheck. Wendy Davis' campaign math makes as much sense as me adding my salary to his and claiming that "Rumpf/Rumph in Austin will be paid millions in 2014." That's complete nonsense and you'd laugh at me if I tried it. ...A couple of interesting things to note here. 1) Wendy Davis' fundraising momentum apparently slowed down after she declared for Governor. She raised more in her Texas Senate officeholder account (likely overwhelmingly in early July, but we'll see) than in her gubernatorial account. 2) For months, we've been hearing how Wendy Davis is going to raise $10+ million dollars in the second half of 2013. She raised $8.7. A big fail. ...When the actual reports hit the Texas Ethics Commission website, it will be interesting to see just how little cash on hand Wendy Davis has relative to Greg Abbott. It will also be interesting to cast a critical eye on the actual numbers and see what percentage of funds came from out-of-state individuals and entities. As a benchmark, Greg Abbott's campaign says that he has $27 million cash on hand and that 97% of his donors are from Texas. 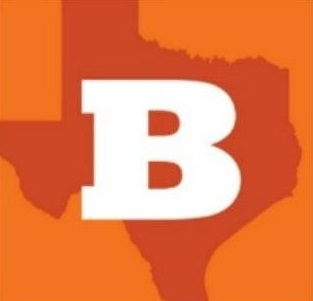 Texas is still a conservative state. 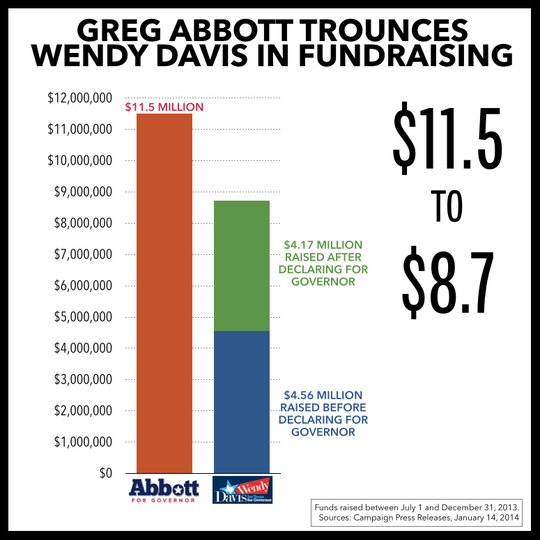 Wendy Davis may have raised a great deal of money from liberals in liberal bastions, but the bottom line is that she still didn't raise as much as Greg Abbott in an apples to apples comparison of actual campaign accounts, and she likely trails by tens of millions dollars in actual cash on hand. An "in-kind" contribution is a donation of something other than money - goods or services - and it's up to the donor to tell the campaign the "fair market value" of the donation. This can lead to some "creative" math. How do you value volunteer time? I'm usually pretty skeptical of claims of donating tens of thousands of dollars of "consulting" or "staff" services. In-kind contributions don't count when you are calculating "cash on hand," and "cash on hand" is critical when determining the actual strength and viability of a campaign. I've seen many campaigns that were decent at raising money, but had a ridiculously high burn rate and were sometimes vulnerable to opponents with much less money. If someone gives money to a PAC and then the PAC gives money to Davis, those funds should only be counted once. If someone from New York donates money to a Texas PAC and then that Texas PAC donates to a Texas candidate, is it fair to say that money was "raised in Texas?" I wouldn't think so.